Well I am on my way, I did a condensed school program and in 4 months did a 2 year college degree. I have now written all my certs for that and then some. 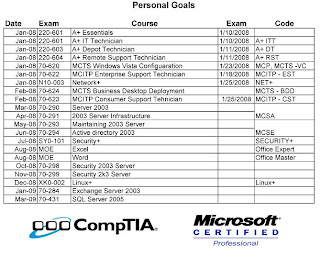 I am focusing on CompTIA and Microsoft certifications at the moment. And last summer I did all 5 Microsoft Office Specialist exams. These exams give me a number of designations outlined in this post "Inner Geek Validated" which was a continuation of "Unleashing the Inner Geek" and "Microsoft Office Specialist" I plan on doing the following through self-study 1 course a month for the next year and a bit. Should be a fun ride. After that I want to do the intro MAC Hardware and Software Certs just for fun. This is a picture of the schedule I have set up. So just to let you know a lot of the books being reviewed over the next year will be geek speak! Earlier I wrote about having an inner geek, and working on some certifications, specifically the Microsoft Office Specialist, and about playing with multi OS's. Well that combined with some recient schooling has produced a score of computer certifications. Below are the different logo's representing the specific certifications. The Logo's are in the order that I earned the right to use them. And my next post will outline the schedule of certifications I plan to write over the next year and a bit. Though I love reading and books dearly, few books capture a spirit or goal in my own life as closely as this book does. For years now I have been struggling to achieve an inner and outer balance in my life - balance between mind, body and spirit. In attempting to do so, I have tried various tools, and methods, and strategies. Yet inevitably I find myself off kilter. Now this book seems to be a resource that will help to achieve that balance. The main reason for that is the person that Dr. Kevin Vost is. He has been a lifelong enthusiast of both academic learning and of physical fitness. 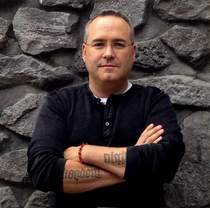 He has written and published extensively in the realm of physical fitness and in cognitive and memory mechanics. Dr. Vost does not just write about these topics he also practices them, which makes him an authority not just theoretically but also practically. Dr. Vost has done graduate work and post- graduate work academically and he also has competed in power lifting. The book flows nicely from topic to topic. It is designed to help you find balance in your life - to be neither a gym rat, nor a book worm, but to have the best of both worlds. It combines wisdom from classical authors down to current competitive athletes. He states: "Intensity and duration of effort, you see, are inversely proportional. How's that? A well-known saying in HIT circles is that 'you can train hard, or you can train long, but you can't do both.' The more demanding the exercise, the shorter the time you're able to sustain it. The harder you work, the sooner you must stop. We all know this from experience. And the kind of exercise that maximizes physical strength is not only intense but also brief." He will teach you to get more results from less time in the gym, and thus have more time for family, friends, leisure and your favorite 'books'. Some books are great because of the quality of the writing. Some books are great because of the content or message they convey. Some books are great because of the reputation they garner, and over time, come to be considered classics. Dr. Kevin Vost has written a book that fits the first two categories and only time will tell about the third. The author, who has done both graduate work and doctorate work on memory, has written this book as a tool to help Catholics memorize their faith. However, it is also so much more than that. It can be a tool used by any serious academic to help them memorize, learn to think more creatively, plan and execute research and papers. If you read the book for the techniques taught alone, it will be an invaluable asset to any intentional student. Dr. Vost states "The text and illustrations have been structured in such a way that, if you read slowly and carefully, look at the pictures, and follow the instructions, by the time you finish, you'll be able to remember and name the Ten Commandments, the seven capital sins, the seven virtues, the nine Beatitudes, the seven sacraments, the twenty mysteries of the Rosary, and yes, if you are ambitious enough, even the names of the forty-six books of the Old Testament and the twenty-seven books of the New Testament. And all of these in order, both forward and backward!" Through the processes, he uses a method of memorization that traces its roots and origins to the ancient Greek poet Simonides and the philosopher Aristotle, and to Marcus Tullius Cicero. These techniques were then taught and practiced by the Doctors of the Catholic Church, St. Albert the Great (the "Universal Doctor") and St. Thomas Aquinas. These techniques are collectively known as mnemonics. Through the progression of learning the memorization skills you will develop greater abilities and strengths in these areas: organization, imagination and concentration. There is so much we still do not understand about the human brain, but we do know from much research, including some of Dr. Vost's, that the more we use the brain, the more we can use it. It can be retrained after injury. Studies that have been done on surgery patients, Alzheimer's patients and others all show that working the brain can help fight diseases. Vost's techniques will help the reader to learn to organize thoughts and thought processes more clearly, use the imagination to stretch the brain and work it out in new and different ways. Then the concentration involved in the first two activities, combined with repetition, can lead to memory skills that will serve you for a lifetime. Vost writes in a fun and engaging manner. This book is written with many target groups in mind. He writes for the practitioner of the Catholic Faith that wants to be able to answer the lists he gives above, and many, many more. He writes for a younger audience who wish to understand their faith. He writes for all students who need the skills presented in this book to help them learn to be better students and scholars. The greatest strength of this book is Dr. Vost's background in research, and practice in implementing these systems in the field of Psychology, and his love for his religious tradition. The weakness of the book is the memorization techniques. Tips and tricks are so great you will have to study Catholicism to learn them. An added bonus is that at the end of each chapter is a toolbox called 'Memory Master Tips and Facts'. These boxes help you apply the material in an easier fashion. Therefore I would declare that this is a great book, for the old and for the young in the faith. It is also a good resource for any academic or lifelong learner. This is a great book - plain and simple. Meme Booked by 3 - January From Shelly's Bookshelf! 1. List up to 3 books you read in 2007 that you loved. 2. List up to 3 books you read in 2007 that were disappointments. 3. 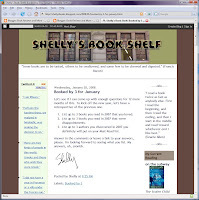 List up to 3 authors you discovered in 2007 you definitely will put on your Must Read list. Answer in the comments or leave a link to your answers, please. I'm looking forward to seeing what you list. You can also see my complete list of books read by year here, favorite books each year here and favorite authors here. Just over 2 and a half years ago I took a construction job to make more money over the summer to try and finish my schooling faster. After about 3 months I tore my rotator cuff. And spend more than 2 year recovering and looking for work I could do around my injury. For more than a year after the injury I went to physiotherapy 5 days a week. It helped keep the pain at bay and treated the symptoms but because of the location of the tear did not promote the healing that was needed. Then I had surgery, 6 weeks after my daughter Abby was born. I spent the next 10 weeks in a sling, not even able to hold my daughter except when she slept. After a year of physiotherapy 3 days a week, since the surgery they decided it was as good as it was going to get. During this whole time I prayed and prayed for a job. I applied for over a hundred jobs, without a single interview. Last summer I started retaining through WSIB, I did my Microsoft Office Specialist Certifications for word, excel, access, powerpoint and outlook. I also took a course in business communications, Then in the fall I started my Network Specialist training, which comprised a number of certifications through both Microsoft and CompTIA. I did have the privledge of donating bone marrow this year and writing a series of articles to promote the Unrelated Bone Marrow Donor Registry. Then in December it all started coming together, I have a job now I love. I am currently on contract which should roll into a fulltime position in March. We received a settlement for the injury. And tomorrow we are having a c-section and I will meet my son. What does all of that have to do with New Year's Resolutions you might ask. A lot, in the last year I stopped journaling, and practically stopped praying. Even when I interviewed for this job I found it hard to pray for it because of all the disappointment over the last few years. My goals for this year are simpler then some in the past. I want to start journaling again. I wish to work out consistently again. I desire to drop the extra pounds I have gained since the injury. I want to be a person of prayer and hope again. During this past year I stopped using my accountability sheets I have been using for years. I have revamped it for this year and hope to use it to help find balance between body, mind and spirit. I want this to be a year of action and progress. Of real change! "Observe always that everything is the result of change, and get used to thinking that there is nothing Nature loves so well as to change existing forms and make new ones like them." "Mere change is not growth. Growth is the synthesis of change and continuity, and where there is no continuity there is no growth."